Free download Nokia Suite latest version or Nokia Ovi Suite. It is computer application for Nokia devices to connect them to your PC. 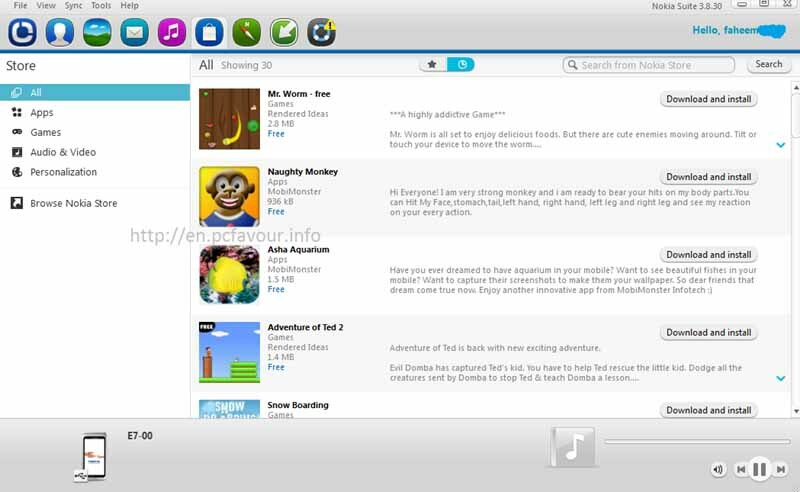 This application has same functions as Nokia PC Suite the difference is that Nokia Suite supports latest versions of Nokia such as Asha, Symbian Belle and Anna. Nokia Ovi Suite was renamed with Nokia Suite later. The application has a lot of features for your Nokia devices such as to store a complete backup for your device. It will save all files of your Nokia device into .nbu format. You can restore this to your Nokia device any time using Nokia Suite. The other features are software update, download maps, ovi store access, music, messaging, Gallery, and contacts. You can synchronize your contacts and import all messages from your phone and also can use this application to send messages via your Nokia phones. You can search applications from Nokia ovi store (Internet required on your PC) and can install it on your phone using Nokia Suite. Nokia Suite also provides you the access of your mobile storage e.g. memory card from both phone and pc. If you connect your phone without Nokia Suite then memory card will be disconnected from phone. Nokia Suite makes your work easy if you work on your computer system. You need to connect your Nokia phone through USB cable or Bluetooth to your PC and then you can use both PC and Mobile from your PC. You can read messages, reply or forward any message, delete or add contacts, delete conversation, copy files from and to your mobile such as music, videos, photos, documents and etc.